Spokesman for Chihuahua state says US agencies don’t want to end drug trade, a claim denied by other Mexican officials. Juarez, Mexico – The US Central Intelligence Agency and other international security forces “don’t fight drug traffickers”, a spokesman for the Chihuahua state government in northern Mexico has told Al Jazeera, instead “they try to manage the drug trade”. Allegations about official complicity in the drug business are nothing new when they come from activists, professors, campaigners or even former officials. However, an official spokesman for the authorities in one of Mexico’s most violent states – one which directly borders Texas – going on the record with such accusations is unique. A spokesman for the CIA in Washington wouldn’t comment on the accusations directly, instead he referred Al Jazeera to an official website. Villanueva is not a high ranking official and his views do not represent Mexico’s foreign policy establishment. Other more senior officials in Chihuahua State, including the mayor of Juarez, dismissed the claims as “baloney”. More than 55,000 people have died in drug related violence in Mexico since December 2006. Privately, residents and officials across Mexico’s political spectrum often blame the lethal cocktail of US drug consumption and the flow of high-powered weapons smuggled south of the border for causing much of the carnage. “The CIA wants to control the population; they don’t want to stop arms trafficking to Mexico, look at [Operation] Fast and Furious,” he said, referencing a botched US exercise where automatic weapons were sold to criminals in the hope that security forces could trace where the guns ended up. Blaming the gringos for Mexico’s problems has been a popular sport south of the Rio Grande ever since the Mexican-American war of the 1840s, when the US conquered most of present day California, Utah, Nevada, Arizona and New Mexico from its southern neighbour. But operations such as Fast and Furious show that reality can be stranger than fiction when it comes to the drug war and relations between the US and Mexico. If the case hadn’t been proven, the idea that US agents were actively putting weapons into the hands of Mexican gangsters would sound absurd to many. In 1996, the San Jose Mercury News published Dark Alliance, a series of investigative reports linking CIA missions in Nicaragua with the explosion of crack cocaine consumption in America’s ghettos. In order to fund Contra rebels fighting Nicaragua’s socialist government, the CIA partnered with Colombian cartels to move drugs into Los Angeles, sending profits back to Central America, the series alleged. “There is no question in my mind that people affiliated with, or on the payroll of, the CIA were involved in drug trafficking,” US Senator John Kerry said at the time, in response to the series. “It’s true, they want to control it,” a mid-level official with the Secretariat Gobernacion in Juarez, Mexico’s equivalent to the US Department of Homeland Security, told Al Jazeera of the CIA and DEA’s policing of the drug trade. The officer, speaking on the condition of anonymity, said he knew the allegations to be correct, based on discussions he had with US officials working in Juarez. 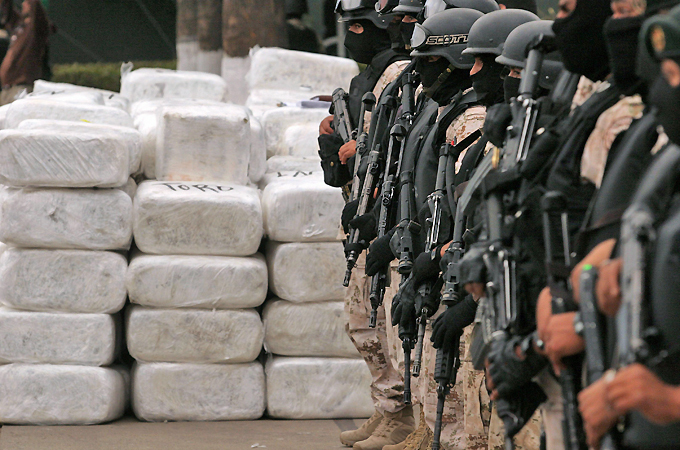 Acceptance of these claims within some elements of Mexico’s government and security services shows the difficulty in pursuing effective international action against the drug trade. The Sinaloa cartel is Mexico’s oldest and most powerful trafficking organisation, and some analysts believe security forces in the US and Mexico favour the group over its rivals. Joaquin “El Chapo”, the cartel’s billionaire leader and one of the world’s most wanted men, escaped from a Mexican prison in 2001 by sneaking into a laundry truck – likely with collaboration from guards – further stoking rumours that leading traffickers have complicit friends in high places. “It would be easy for the Mexican army to capture El Chapo,” Mireles said. “But this is not the objective.” He thinks the authorities on both sides of the border are happy to have El Chapo on the loose, as his cartel is easier to manage and his drug money is recycled back into the broader economy. Other analysts consider this viewpoint a conspiracy theory and blame ineptitude and low level corruption for El Chapo’s escape, rather than a broader plan from government agencies. After an election hit by reported irregularities, Enrique Pena Nieto from the Institutional Revolutionary Party (PRI) is set to be sworn in as Mexico’s president on December 1. “I am hopeful that he will not return to the PRI party of the past which was corrupt and had a history of turning a blind eye to the drug cartels,” said Michael McCaul, a Republican Congressman from Texas. Regardless of what position a new administration takes in order to calm the violence and restore order, it is likely many Mexicans – including government officials such as Chihuahua spokesman Guillermo Villanueva – will believe outside forces want the drug trade to continue. The widespread view linking the CIA to the drug trade – whether or not the allegations are true – speaks volumes about officials’ mutual mistrust amid ongoing killings and the destruction of civic life in Mexico.